The Vintage Winter kit from Swirlydoos, with papers from Bo Bunny's Winter Wishes collection and a variety of coordinating embellishments from companies such as Prima Marketing, Kaisercraft and Darice had me searching through my saved images in Pinterest for this one - an old-fashioned scene of a frosted woodland. I actually cropped the picture and enlarged it a bit to bring the bridge and surrounding foliage to the front. 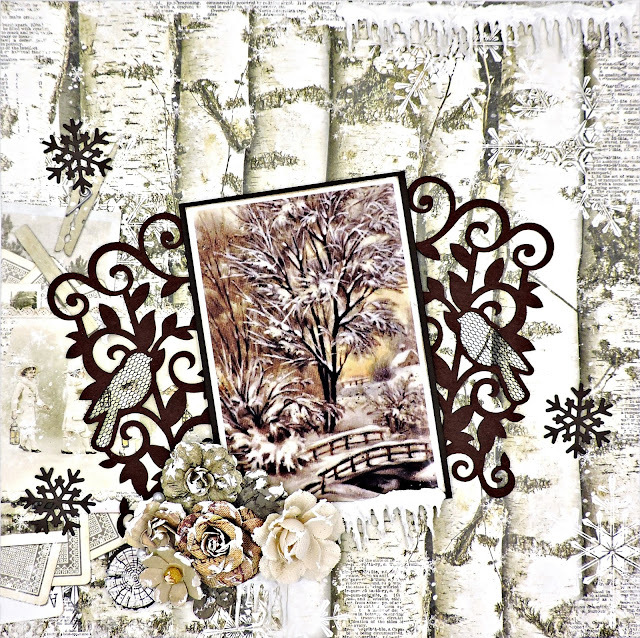 The Winter Wishes sheet with varied details over a birch-like pattern makes a lovely background for my photo and the Prima Felt Gate, cut in half down the middle, makes a perfect frame. 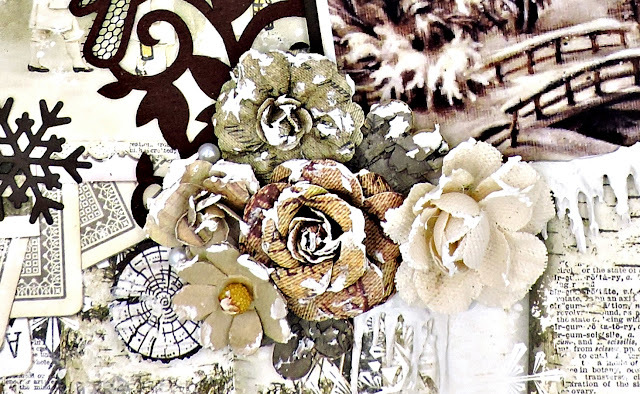 I've gone deep into my stash for the flowers and icons, finding a variety of Prima flowers, bark embellishments and a wood icon from the Salvage District Collection. After scattering a few Kaisercraft pearls on the edges, I "frosted" the flowers here and there with the Aleen's Glitter Snow that came in the kit. Lastly, I adhered several Darice Rusted Tin Snowflakes around the page to give a bit of interest.